The church was organized in 1880. Under the pastorship of Reverend James Grant, the ground on Maisel Street in Baltimore was purchased to establish the Mount Winans First Colored Baptist Church. The Articles of Incorporation were adopted on April 10, 1919 and were officially documented and recorded by the State of Maryland on July 14, 1919. On October 17, 1945, the church bought two lots known as 2417 Puget Street because there was a need to expand the church program and to meet the needs of the people. In 1980, the church celebrated its centennial anniversary. 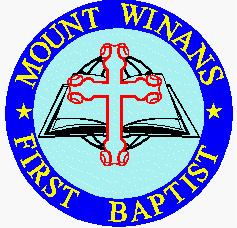 On April 25, 1996, an amendment to the Articles of Incorporation to legally change the name from the Mount Winans First Colored Baptist Church to the Mount Winans First Baptist Church. In July, 1998, Reverend Dr. William L. Cain became the current pastor. Since that time, he has made great strides in leading the congregation to higher heights. New additions continue to be added for the uplifting of the kingdom.